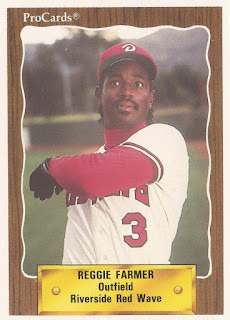 Reggie Farmer played both football and baseball at UNLV. In February 1984, he told the UNLV Rebel Yell the sport he preferred: football. "It will all come down to where I can play and how much money (is offered)," Farmer told The Rebel Yell of his sporting hopes for after college. "I'd like to play on the West Coast. Football is my first choice. I'd love to play for the San Diego Chargers." Farmer eventually went pro in baseball, not football. He played a total of five pro seasons, never making AA. He has since gone on to another calling, that of a teacher and school principal. Farmer's pro career began in 1987, taken by the Padres in the ninth round of the draft out of UNLV. At UNLV, Farmer won conference co-offensive Player of the Week honors in football in October 1983. By the end of that September, he had three touchdowns. He hauled in a touchdown in a game late that month. Farmer started with the Padres at short-season Spokane. He hit .253 in 69 games. Farmer picked up two hits in a June game and scored both team runs in the 2-1 victory. He picked up three hits in an August game. In another August contest, the outfielder Farmer cut down a runner at home, according to The Spokane Chronicle. Catcher Bob Lutticken. "Tonight, I concentrated more," Farmer told The Chronicle of the throw and a previous one that missed. "I figured it was a close game and they would let him go. Bob blocked the plate, and we got him." Farmer moved to single-A Charleston for 1988. He hit .261 there, with 26 stolen bases. He played 1989 between single-A Waterloo and single-A Riverside. He hit .281 overall, stealing 41. He returned to Riverside for all of 1990, then played 1991 at high-A High Desert. He hit .255 in 1990 and .274 in 1991, marking the extent of his professional career. Farmer then went into education. He became an elementary school teacher in the Las Vegas area and a technology specialist. He then became an administrator. In 2011, Farmer won appointment as principal at Somerset Academy, a charter school in North Las Vegas. "It's just an opportunity for us, as leaders, to grow," Farmer told The Las Vegas Review-Journal in July 2011 after his appointment. "Now we get a chance to put in to play all the things we've wanted to do as principals, from the ground up. These buildings are our babies from bottom to top."